Unregulated activation of Src kinases leads to aberrant signalling, uncontrolled growth and differentiation of cancerous cells. Reaching a complete mechanistic understanding of large-scale conformational transformations underlying the activation of kinases could greatly help in the development of therapeutic drugs for the treatment of these pathologies. In principle, the nature of conformational transition could be modelled in silico via atomistic molecular dynamics simulations, although this is very challenging because of the long activation timescales. Here we employ a computational paradigm that couples transition pathway techniques and Markov state model-based massively distributed simulations for mapping the conformational landscape of c-src tyrosine kinase. The computations provide the thermodynamics and kinetics of kinase activation for the first time, and help identify key structural intermediates. 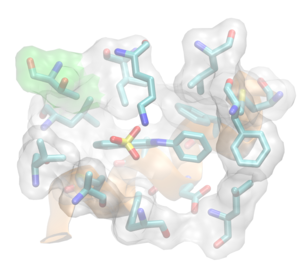 Furthermore, the presence of a novel allosteric site in an intermediate state of c-src that could be potentially used for drug design is predicted. Please visit altmetric.com to learn more about the news items and other reports related to this article.